Answer this question. You have 20 CDs with mp3 and other files. Each CD has several hundred files. You need "that one" mp3 (of any other) file. In fact, you don't even remember the exact name of the file. How long will it take you to locate it? The correct answer is 1 second if you have ACAT Pro installed and about half a day if not. 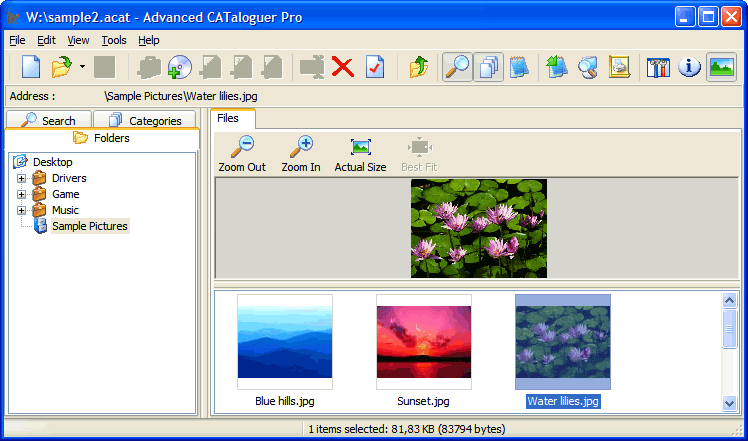 ACAT Pro is an advanced file cataloging utility which can be a real lifesaver for anyone who doesn't store data in one place. The program can instantly find any file stored on CDs, DVDs, local or network drives, removable drives and other types of storage media, including virtual drives. It works even if the storage media device is not currently inserted/connected to a computer. This is how it works. Each time you connect a drive, insert floppy, CD or DVD, the program scans the contents of the storage media device and enters information about files it contains. It also extracts images and data, making it possible to perform searches using Boolean expressions, file names, descriptions, notes, words, phrases, text segments, MS Office document summaries, file size and date of creation parameters. The utility is a must-have tool for any person who has an abundant collection of mp3 files because ACAT Pro can find mp3 files using IDE3 tag parameters (like album or author names, song titles, etc). The utility is of great assistance for quickly locating backed up files that are stored on "one of those CDs". In addition, the program can also identify duplicate files. You have a choice of comparing files by their name, size, date, or CRC32 code, making it absolutely impossible to miss identical files or erroneously confuse different ones. When performing synchronization, the program displays a list of new, modified and deleted files. You can also create "common folders" that "contain" certain file types, even though they are really stored in different places. These and other options are available in ACAT Pro's FREE trial version. This site does not contain serial number, crack, keygen Advanced CATaloguer Pro serial number : serial number is the simplest type of crack. A serial number(cdkey,product key,etc) is register the program as you may already know. a crack or keygen may contain harmful software. If you cannot find the exact version you want, just give it a try. for more information read .nfo/.txt/.diz file include in zipped file.